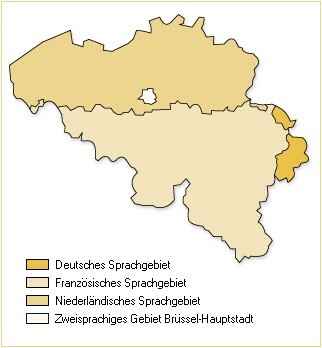 The German-speaking Community is the smallest of the three federal communities in Belgium. On a territory of 854 square kilometre it has a population of 73 000 inhabitants. These are predominantly German-speaking Belgian nationals, but also Walloon, Flemish and foreign citizens. The area consists of the municipalities of Amel, Büllingen, Burg-Reuland, Bütgenbach, Eupen, Kelmis, Lontzen, Raeren and St. Vith. The Kingdom of Belgium is a federal state consisting of three autonomous communities, three regions and four language areas. 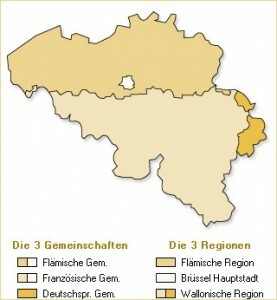 The three communities are the Flemish Community, the French Community and – as the smallest constituent part of the state – the German-speaking Community. Just like the two large communities, the German-speaking Community has political autonomy. The history of the German-speaking part of Belgium is full of change and is characterised by its position on the border that it has had from time immemorial. Already in Roman times the border between the old Roman towns of Cologne and Tongeren run right through the region. After the Congress of Vienna in 1815 the area belonged to the Kingdom of Prussia and German became the official language. As a part of Prussia, after the foundation of the empire in 1871, the area became also part of the German Empire. After the Versailles Peace Treaty the district of Eupen-Malmédy was ceded to Belgium as the Eastern Cantons. With the language legislation of 1963, Belgium was divided in three language communities; this was effectuated in 1970 and from then on the Council of the German Cultural Community (RdK) has been active, the direct predecessor of the Council of the German-speaking Community (RDG), from 2004 onwards called the Parliament of the German-speaking Community (PDG). The three official languages of Belgium are Dutch, French and German. Additionally there are very lively autochthonous regional languages (e.g. Walloon and Picard, Luxembourgish, Limburgish, etcetera) for which specific associations are working; these languages receive a certain degree of recognition by the authorities and receive support. But these regional languages are not used as official languages or as languages in schools. Considering the general linguistic homogeneity of the four language areas the legislator decided to choose for the principle of territorial monolingualism as regards administration and education, with the exception of Brussels, which is officially bilingual and is administrated in both French and Dutch. That also means that Belgium is a trilingual country, a country with three official languages, but that each of these languages areas has only one single official language, with the exception of Brussels, which has two. In some areas directly adjacent to the language divide, the percentage of people speaking another official language than that of the area has always been very large. Therefore the legislator expressly provides for these areas – and only for these areas (they are enumerated in the law) – that the citizens of this linguistic minority, if they wish so, have the opportunity to receive some services in their mother tongue. The local public entities have to be organised in such a way that the citizens can be serviced not only in the local language of the area, but also without the slightest problems in the other official state language, i.e. every citizen has the right to use his or her language (as long as it is one of the three official state languages) in communication with the authorities, also if they are not in the specific language area. The service in the German language by regional and federal authorities, however, leaves something to wish for, even if significant efforts have been put into it and progress has been made. The inhabitants of the German-speaking Community consider themselves as people living in a core region of Europe with easy access to four different countries (B, D, NL and L). 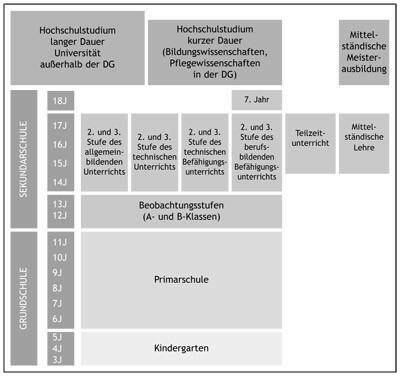 They predominantly use the high-German standard language in administration, schools, in church and in social relations. Apart from that dialects still play a role in social contacts. 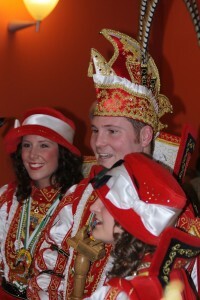 A minority of the population, mainly in the northern municipalities of Kelmis, Lontzen and Eupen speak French. Based on the territorial principle that is effected in Belgium, no official surveys are allowed into the numerical ratio between German-speaking and French-speaking inhabitants. The people are loyal Belgians, in general attached to the monarchy. They feel respected by the state, since German has been recognised as one of the three official constitutional languages. The political autonomy of the German-speaking Community significantly contributed to fact that the German-speaking population considers itself to be a full-fledged constituent part of the Belgian state. The German-speaking Community (DG) may be an autonomous and largely sovereign public entity, but as constituent part it is remains strongly integrated in the federal structures of Belgium. The German-speaking Community is officially recognised by Article 2 of the Constitution. Through Articles 115, 121 and 130 it has approximately the same legal status as the French and the Flemish Community, i.e. it has approximately the same autonomy and the same powers. The institutions that enact the autonomy are qualitatively equal. The German language area does not form one electoral district, neither for the elections to the House of Representatives, nor for the directly elected Members of the Senate, nor for the elections to the Walloon Regional Parliament. Therefore, there is no guaranteed representation in each of these legislative assemblies. Only the designation of one senator designated by the Parliament of the German-speaking Community is legally guaranteed. The Ministry is the administration of the German-speaking Community. It employs about 160 people. Political decisions are prepared by the Ministry and eventually implemented. In the past years a modernisation of the administration took place. Over the 25 years of its existence the Ministry changed from a small office into a medium-sized enterprise. The Parliament of the German-speaking Community (DG) has all the traditional functions of a parliament. Besides its legislative activities it elects the government that consists of four ministers and controls the work of the government. It sends one of its members as Community Senator to the Senate in Brussels. The DG-Parliament performs its control function through topical questions and interpellations in plenary meetings and by written questions, which are published as official documents together with the answers of the responsible ministers. The Parliament of the German-speaking Community is the representation of the German-speaking Belgian people. The official language of the DG-Parliament is German. The Parliament has 25 members, who are directly elected every five years. The latest elections took place on 7 June 2009. The most important tasks of the DG-Parliament are the election and control of the government, the adoption of decrees (provisions with the status of law) for the German-speaking Community and the annual adoption of the budget of the Community. The German-speaking Belgian people have their own parliament since 1973. Originally it was called the Council of the German Cultural Community (RdK), and from 1984 until 2004 its name was the Council of the German-speaking Community (RDG). Since a change in the Belgian Constitution of July 2004 the body officially is called the “Parliament of the German-speaking Community”. Since October 2013, its seat is located at Platz des Parlaments (Parliament Square) nr. 1 in Eupen. The three communities in Belgium are responsible for education, with the exception of the definition of the beginning and end age of compulsory schooling, the minimum requirements for issuing diplomas and the pension schemes for personnel working in the education sector. Freedom of education is defined in the constitution of the Kingdom of Belgium. The establishment of educational institutes may not be restricted. It is therefore possible to establish schools without any links to public authorities. Nevertheless schools that want to issue recognised diplomas and that want to receive funding from the community, will have to comply with the legal provisions. Most children visit kindergarten from an age of 3 years. Compulsory schooling starts first at the age of 6 years, when children enter primary school. The students are required to attend school fulltime until the age of 15-16, and part time until the age of 18. Normally every school student spends three years in kindergarten, six years in primary school and six years in secondary school. The language of instruction is German and the first foreign language is French. Already in kindergarten children are offered French-language activities, which prepare them for foreign language instruction in primary school. Whilst in primary school there are additional foreign language activities next to foreign language learning, in secondary school there is the chance to choose the first foreign language as language of instruction. From the 8th grade English is a compulsory subject and therefore the second foreign language. From the 9th grade students have the chance to learn Dutch as another foreign language.